Form 05-163 is a Texas Comptroller of Public Accounts form also known as the "Texas Franchise Tax No Tax Due Report". The latest edition of the form was released in September 1, 2017 and is available for digital filing. 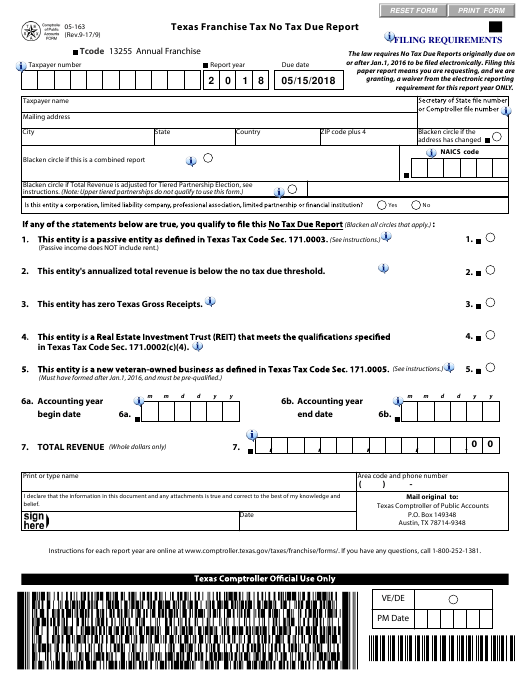 Download an up-to-date fillable Form 05-163 in PDF-format down below or look it up on the Texas Comptroller of Public Accounts Forms website. requirement for this report year ONLY. 2. This entity's annualized total revenue is below the no tax due threshold. 3. This entity has zero Texas Gross Receipts. in Texas Tax Code Sec. 171.0002(c)(4). Instructions for each report year are online at www.comptroller.texas.gov/taxes/franchise/forms/. If you have any questions, call 1-800-252-1381.